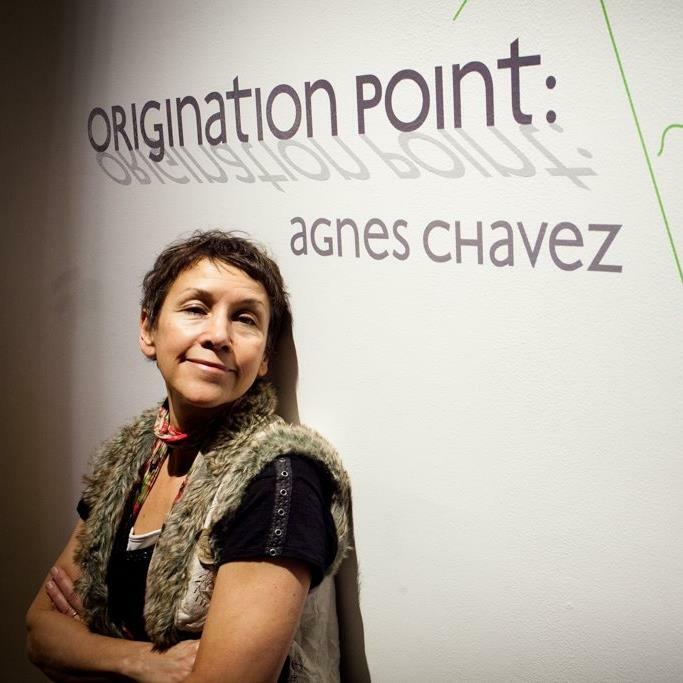 Agnes Chavez is a new media artist, educator, and co-director of The Paseo Taos. The Harwood Museum of Art is featuring Agnes’s installation entitled Origination Point, which is on view through May 1, 2016. Created with collaborators Marcel Schwittlick and Robert Schirmer, Origination Point is a generative interactive projection installation inspired by particle physics and the origins of the universe. The work was originally exhibited at the 12th Havana Biennial in Havana, Cuba. Agnes invited us to her studio on the Taos mesa to share her passion for art, science and technology. Agnes Chavez at the Harwood Museum of Art. Photo by Genevieve Russell. 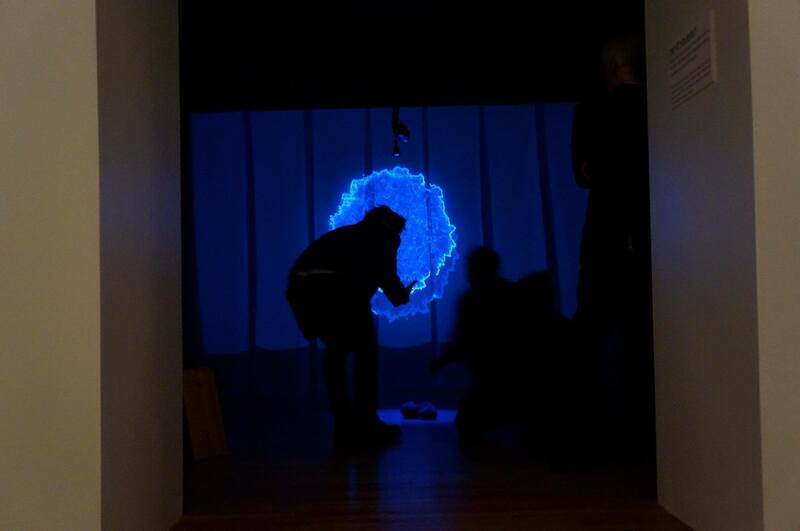 Origination Point is a generative projection and sound installation in three acts representing aspects of the universe’s origins and the formation of matter. People are drawn into the darkened space by the soundtrack that interweaves field recordings from earth and outer space. Leaning over to move lava rocks triggers shifts in the layers of the sound composition. The space is surprisingly meditative in its immersiveness. Its sounds can be heard in other galleries and transforms the museum experience. Photo by Joaquin Karcher. In 2009, Agnes founded STEMarts Lab to create youth-focused 21st century tools and learning opportunities as part of new media art and science festivals. Projecting Particles is a STEMarts series where particle physics and projection art merge to engage youth. 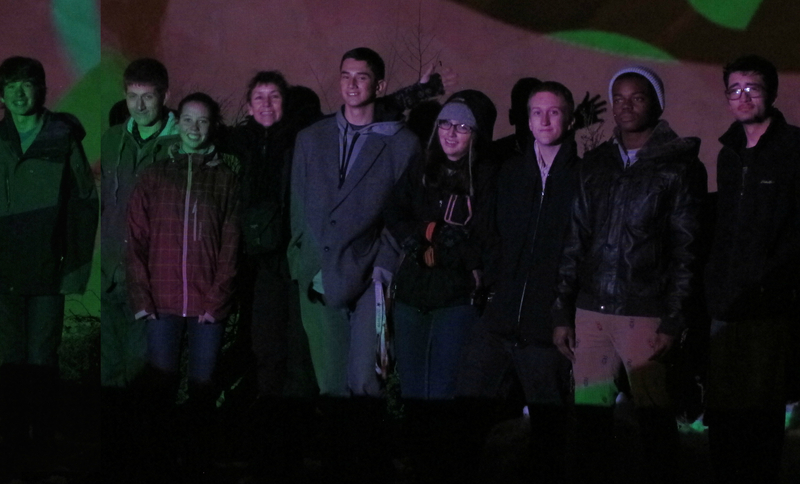 The above photo shows teens from Taos High School and Taos Academy who participated in a teen-led Projecting Particles workshop with the final performance at the 2015 Lighting of Ledoux event. This workshop was sponsored by The Harwood Museum of Art Teen Engagement Program, Los Alamos National Laboratory and ATLAS at CERN. Photo by Joaquin Karcher. 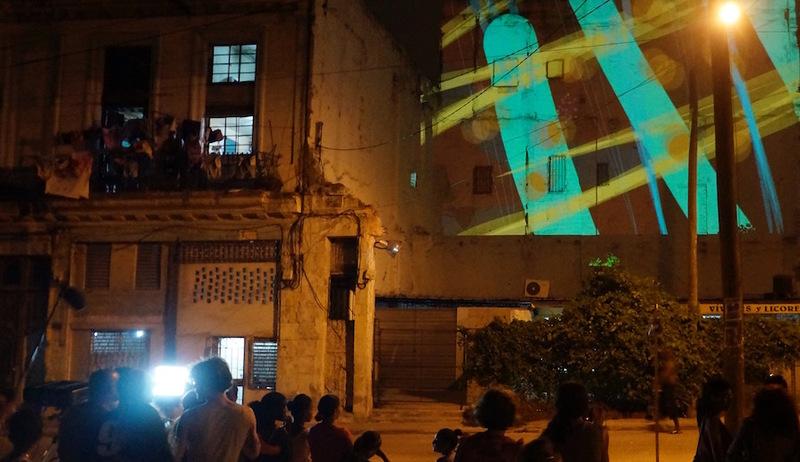 While Agnes exhibited Origination Point at the 2015 Havana Biennial, she also lead a Projecting Particles workshop for Cuban teens. These teens learned how to paint and animate their ideas in real time to project their creativity onto the side of a Havana building. Photo by Agnes Chavez. (x)trees v.4. The PASEO 2014. Agnes Chavez. Alessandro Saccoia. Kamen Dimitrov. 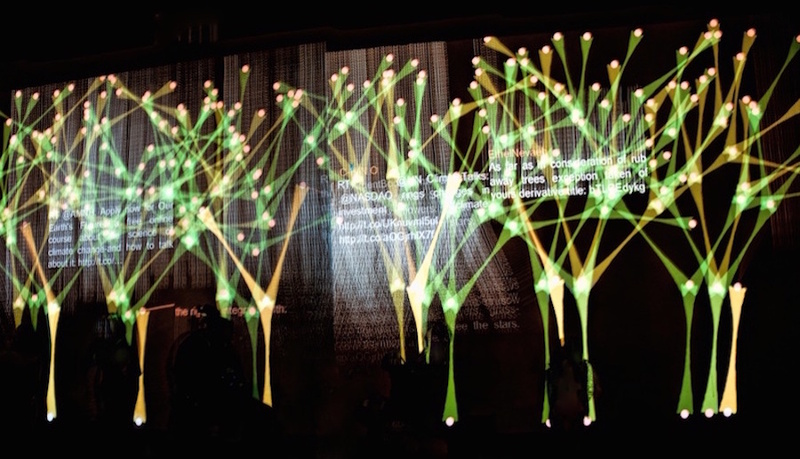 Agnes’ (x)trees project dynamically generates a forests of trees projected onto buildings and other large spaces. Viewers become participants of the (x)trees when they send tweets or text messages and their message appears on the wall with a branch. The keyword is chosen in relation to the event i.e. climate change. 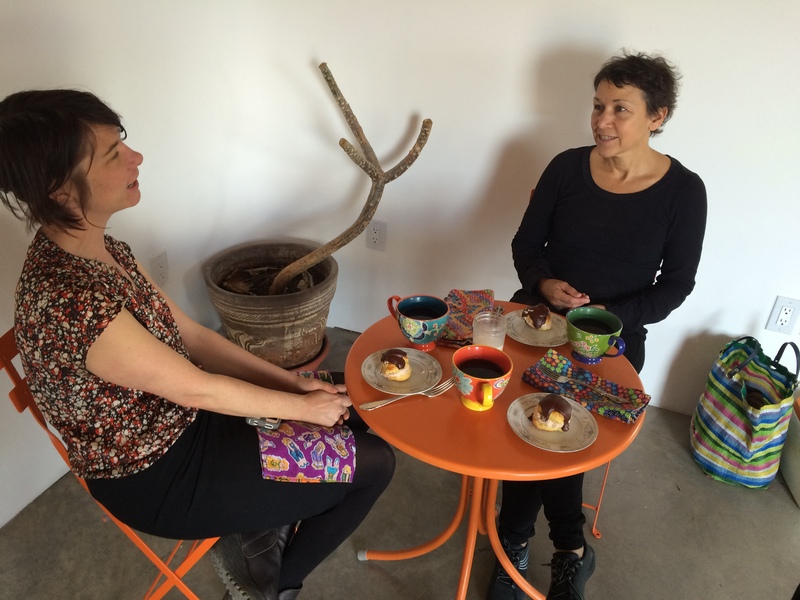 Agnes did a residency at the Santa Fe Art Institute (SFAI) where she explored the timely concept of migrations. The work is envisioned as a projection installation, using real-time migration data of immigrants and refugees. 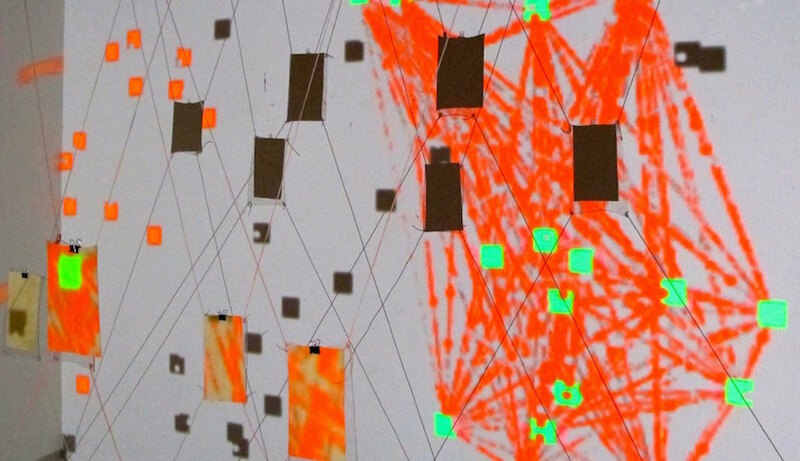 These movements are video mapped onto structures inspired by power lines connecting landscapes. Photo by Agnes Chavez. Liz and Agnes with our tea and cream puffs preparing for the conversation. If you’re near Taos, be sure to catch Origination Point at the Harwood Museum of Art before May 1st. I searched for recipes with Irish Cream in them—like, perhaps, you are doing just now—read through the usual bakery rigamarole & VOILA!! 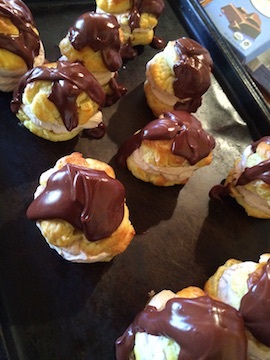 I found “Irish Cream Profiteroles,” cut some of the sugar & shortened the name (what, pray tell, is a Profiterole, sounds too much like profiteer for my taste buds today). 1 CUP All Purpose flour & continue on high heat while you stir & stir until it comes together in a ball. Continue stirring until it starts to coat the bottom of the pan, now you can remove the dough & place in a kitchen aid with the paddle attachment. Once all 4 of the eggs have been incorporated you should have a squirmy looking dough (“the worst snot disaster, ever,” as my teacher would often say, cringe-worthy a statement as that is.) This will get piped out of a pastry bag onto a cookie sheet. 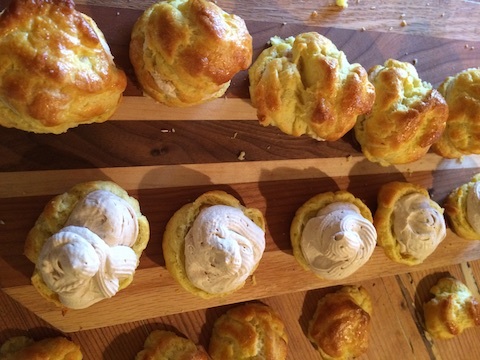 I got 12 balls out of this recipe—& they ended up on the ‘bite-size’ side of the scale—you could make them larger, or smaller depending on your taste for sweets. 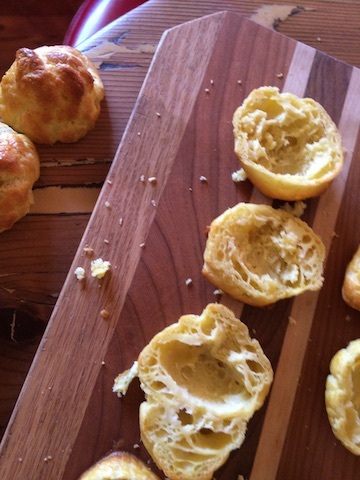 ALSO: you don’t have to use a pastry bag if you don’t have one. You can use a large spoon or ice-cream scoop (the old fashioned ones with the button on the handle work really good, & not so hard to clean as a pastry bag). Place these in the 425° oven & set the timer for 15 minutes—at 15 minutes turn the oven down to 350° & finish—approximately another 15 minutes, depending on the size, of course, giant ones will take a lot longer, etc…. & continue until you have a thick cream so that they will stand up a bit when you fill them. Here are mine filled up. I did use a pastry bag for this part. For the GANACHE: I use equal parts cream & dark Chocolate (around 70%) & no sugar. 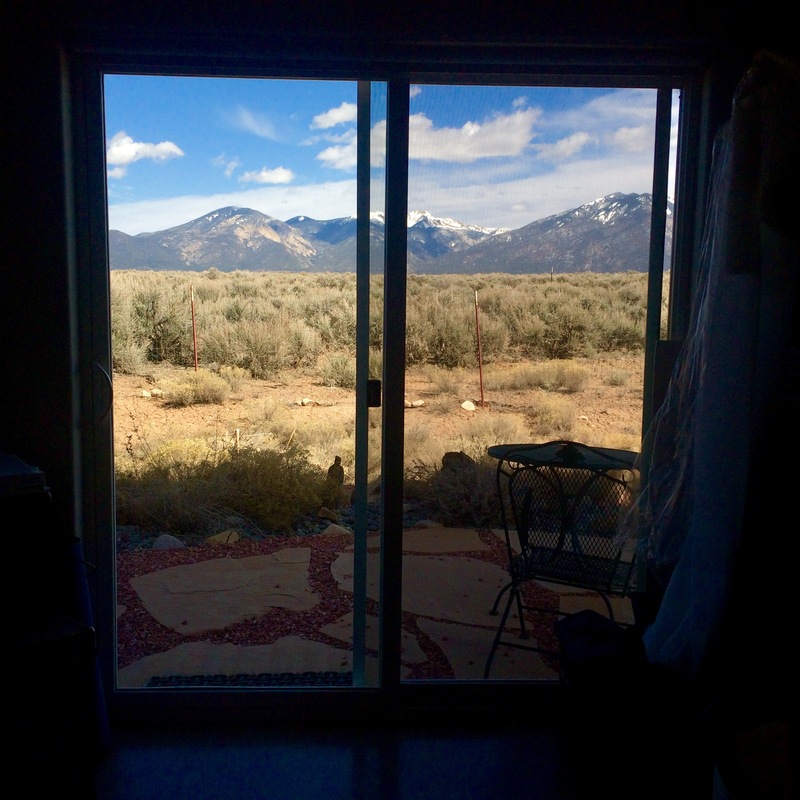 The amazing view from Agnes’s studio overlooking the mesa and mountains of Taos, NM. Thanks to Agnes Chavez and her husband Joaquin Karcher for hosting Art+Tea at their home and studio — both beautifully designed by Joaquin. Art+Tea is a project of the Harwood Museum of Art of the University of New Mexico. The podcast features music by David’s band Art of Flying. Tea-O-Graphy is Art+Tea’s official ‘Tea Sponsor’, providing us with delicious blends to share on our interviews.